Singapore has joined the growing list of countries cracking down on the perpetrators of the multi-billion dollar OneCoin pyramid scheme. Recently, two men were charged in Singapore for promoting a cryptocurrency-based multi-level marketing scheme which is believed to be the first case of its kind in the country. According to local police, OneCoin’s promotional structure breached the Multi-Level Marketing and Pyramid Selling (Prohibition) Act. Each of the perpetrators is facing up to five years in prison and a maximum fine of S$200,000 ($147,000). The Monetary Authority of Singapore (MAS) has listed both OneCoin and One Concept Pte Ltd, along with a host of other related organizations, on its investor alert list. Like in other parts of the world where the OneCoin scam was perpetrated, the SPF said locals were lured to take part in the scheme with offers of promotional tokens after purchasing online educational courses. And as multi-level marketing schemes go, participants were given incentives to recruit others. Back in March, principal scheme manipulators Konstantin Ignatov and Ruja Ignatova were apprehended at Los Angeles International Airport for their role in the international scam. Ignatova, was charged with securities fraud, wire fraud, and money laundering. 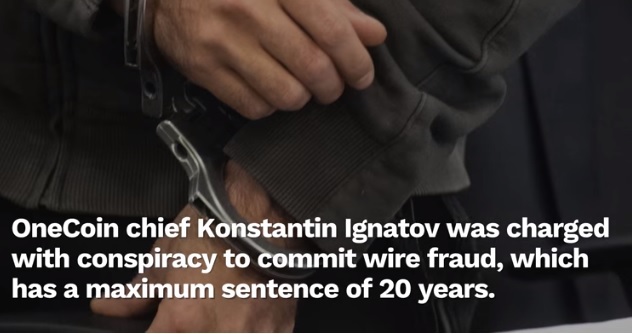 Ignatov was arrested on grounds of conspiracy to commit wire fraud. As is the case with pyramid schemes, investors were promised greater returns for every additional investor they brought to the scheme. However, the scheme was a sham, and none of the “cryptocurrency technology” OneCoin claimed to operate actually existed. Despite all the red flags and being nearly identical to the infamous BitConnect scam, OneCoin has still been able to defraud investors of over S$3 billion. The OneCoin system is similar to the famous crypto Ponzi scheme BitConnect, which also swindled financiers and patrons out of billions (using a real blockchain). Even after BitConnect, investors have become victims to other blockchain-related schemes, most especially around cryptocurrency mining. Although cryptocurrency and blockchain are promising methods to generate income, the novelty of the technology has left many investors vulnerable to trickery and rip-offs. It is vital that users and investors train themselves on how a blockchain works and on best cybersecurity practices in order to protect themselves.